Unfortunately we’ve learned that hard way that this can mean little more than checking a box, by putting a curb ramp that directs people with disabilities into the middle of dangerous intersections, or sharrows that place people biking in harms way. Our coalition of neighborhood groups is committed to holding the city accountable to intent of the complete streets ordinance. 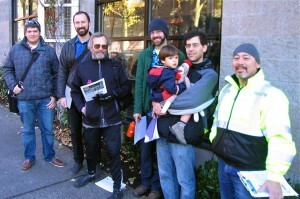 In 2015 we won a complete streets solution for Roosevelt Way NE in the University District, got a commitment from Scott Kubly to incorporate complete streets into SDOT’s repaving program, and got non-arterial repaving prioritized for streets that are important for walking or biking. Thank you to everyone who made these wins possible! Big Win! Thanks to our advocacy, neighborhood greenways will now be repaved before other non-arterial streets! This will enable people walking and biking along neighborhood greenways to do so more comfortably. This is potentially a three million dollar per year cost that will no longer have to come out of the walking and biking budget! It is also a maintenance promise Portland has found useful during public outreach to homeowners. Big Win! SDOT director Scott Kubly commits to doing repaving right. SDOT has committed to being proactive when repaving a street and being opportunistic in incorporating walking and biking facilities. SDOT is building comprehensive project development teams that will no longer pit walking and biking staff against repaving staff. Big Win! Roosevelt Way NE will have major improvements for walking and biking. University Greenways worked hard to highlight the opportunity of repaving Roosevelt Way NE to also build better sidewalks and a protected bike lane. Engaging Cascade Bicycle Club and Feet First they hosted a walking audit and bike brainstorm to identify problems and solutions. Through advocacy they were able to put pressure on the city to do the right thing. Please take a second to thank the city by signing this letter.